Choice can be a wonderful thing. We have so many options to make our lives what we want them to be. We can get exactly the products and services that work for our lifestyles—and our bodies. We can, in effect, customize our lives. But when it comes to plastic surgery, and especially plastic surgery for the face, choice can be overwhelming. The problem is, there are lots of people and practices that tout plastic surgery services, but not all of them are trustworthy. Plastic surgery can be a life-changing decision. And it’s a particularly powerful procedure when performed on a prominent part of the body: the face. But it should also be an exciting, rewarding time—a period to build new self-confidence and relationships. No patient should have to second-guess whether his or her surgeon is going to do an adequate job. Before moving forward, you should feel great about your facial plastic surgery decision. But in a marketplace filled with mixed messages from advertising and social media, for example, it’s hard for consumers to decipher what—and who—they are really getting when they decide to move forward with plastic surgery. So let’s get a few important warnings out of the way right away, so you can move on to selecting the facial plastic surgeon that’s right for you. What credentials does the surgeon have? This is always a safe topic to start your line of questioning to determine the right fit for your cosmetic surgery procedure. Why? Because education and information about a plastic surgeon’s background, credentials and training is less susceptible to being skewed or misrepresented by advertising or opinions. Did or didn’t the doctor earn an applicable medical degree? Where was the surgeon’s residency program? How many years of hands-on training did the surgeon have before opening the practice? What kind of technology or surgical techniques does he or she apply? 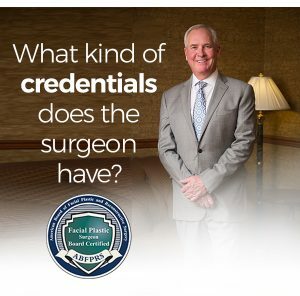 How does the plastic surgeon keep credentials up to date with continuing education? These are very important questions. A good way to judge the validity of a plastic surgeon is by how transparent he or she is about discussing this kind of information. Is it listed prominently on their website? Is the practice willing to openly discuss these credentials? At Smith Cosmetic Surgery, our lead surgeon’s background is available for all to see and review. “Honesty about education is important because more people with credentials helps everyone—patients and the plastic surgery community—because it makes the procedures not seem so risky,” says Dr. Smith. He is proud of all the hard work he put in to become one of the most respected facial plastic surgeons in Colorado, if not the country. If patients have any questions about credentials and what they represent, they can simply visit the Meet Dr. Smith section of our website to learn about how he practices with integrity. “I have 10 years of training alone—four years of medical school, plus six more years of residency and hands-on training,” says Dr. Smith. What area of the body does the surgeon specialize in? Knowing that your plastic surgeon understands the intricacy of the face is essential to feeling good about a facelift or other facial procedure. Dr. Smith learned the art of facial plastic surgery through decades of education, training and experience. 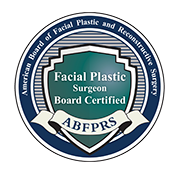 He is double-board certified in the most important medical factions related to the face: the American Board of Facial Plastic and Reconstructive Surgery and the American Board of Otolaryngology-Head and Neck Surgery. 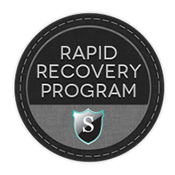 This specialized certification and practice has given Dr. Smith a vast understanding of the physiology of the face, and how bone and muscular makeup affect aesthetics. The two must play well together to create a spectacular result. Are there before-and-after photos of results? Is he or she certified to use certain lasers for follow-up work? What other gimmicks or advertising tricks should I watch out for? Undercutting pricing. Sometimes new or less experienced plastic surgeons lure in unsuspecting clients with low-ball pricing. Facial plastic surgery is not something to buy on price alone. An honest, quality surgeon will work with you on a pricing plan to fit your budget, should that be your No. 1 concern. Selling something else. Make sure that what you’re signing up for is indeed a facelift, not something like it. In the past, alternatives such as the “threadless” procedure undermined the value of plastic surgery. For the record, “threadless” or similarly marketed procedures only address the top fatty layer under the skin. That means results fade quickly, leaving patients wondering what they got into. Giving you the runaround. We’ve said it before, but transparency is one of the best tests of a highly skilled facial plastic surgeon. If the medical professional you are interviewing for your facelift is not willing to share information about education, training, certifications, patient outcomes, testimonials, before-and-after pictures, recovery procedures and follow-up care that’s a big red flag. If you’re considering facial plastic surgery and would like to learn more about your options, please call Smith Cosmetic Surgery today at 303-741-2211 or contact us online to schedule your complimentary consultation. We welcome patients from the greater Denver area and across the United States.